Join us Sat March 24th at 4:30 pm for a unique, hands-on workshop empowering you (and your friends and family!) to free your perspective on sound, find your inner voice, and attain confidence in performance! All instruments/voices and ability levels welcome! Bring a friend (group discounts available)! 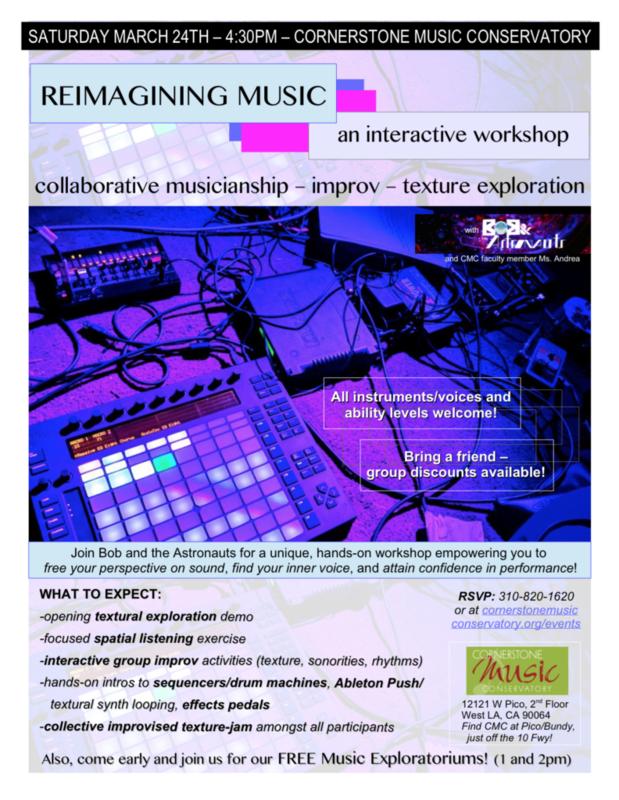 ABOUT THE WORKSHOP: Join Bob and the Astronauts as we explore creating music from a texture-based, active listening and collaborative improvisation-based perspective. Very intuitive/accessible for everyone (all ages! ), musicians/non-musicians alike–come free your inner creative self, and learn to collectively listen and weave tapestries of sound with us! STILL NOT SURE? [MORE INFO]: Experiencing this event will encourage participants to approach music making from an intuitive, listening-based, open-ended mindset, emphasizing the interactive aspects of the creative process and free expression. Textures and tambres take the forefront of our musical explorations! Through the incorporation of easy-to-use non-traditional instruments and sound sources like Ableton Push-controlled synthesizers, an analog drum machine, and effects pedals, the intimidation factor of “not knowing how” or “not knowing enough” to make something “good” is lessened or entirely removed, empowering participants to fully embrace their innate capabilities to create interesting musical pieces and performances. Check out our downloadable 1-page pdf workshop description here. Andrea Vancura (CMC Faculty): I’m a professional musician and educator, on faculty at Cornerstone Music Conservatory in West LA and Hills Academy of Music, Art, and Dance in Torrance in addition to my private teaching studio, with a passion for musical/creative outreach and experimental soundmaking. The Bob and the Astronauts collective shares these goals with the aim to promote self-awareness/mindfulness and open, supportive community experiences through music. Contact Cornerstone Music Conservatory at 310-820-1620 with any questions, and we look forward to having you join us!